Welcome to third instalment of my Brian’s Travel Spot series, which started with my flight out to Hong Kong and continued with my adventures in Hong Kong itself. This post covers my time in Shanghai, which is the second leg of my trip. I’d never been to China before, so when I got an opportunity to go there on business, I took it with both hands. I’ve been in Shanghai all week, but that’s mostly been spent in a meeting room on the first floor of the Hyatt, an interesting mix of modern western hotel, with Chinese architectural influences. So far I’ve not seen much of the city, although from just my limited exposure, I can say that it’s very different to Hong Kong. I’ve now got the weekend to explore before I fly off on the third leg of my trip. Even though I’m still posting updates about my Hong Kong adventures, I wanted to get this post out while I was still in Shanghai, starting with my flight over. As with all the Travel Spots, this post is split into a number of sections which I’ll add to on a regular basis, so don’t forget to check back regularly for updates. You can read about my flight to Shanghai after the gallery. I’d deliberately chosen to spend the week before my meeting in Hong Kong so that I could acclimatise to both the heat and the time zone (seven hours ahead of GMT). When it came to the former, I needn’t have bothered since I spent the entire week of my meeting in an air-conditioned hotel. However, getting myself over the jet-lag proved invaluable during what was a very intense five days of work. And, of course, I got four full days in Hong Kong into the bargain! The flight over from Hong Kong was helped in no small part by Hong Kong’s excellent transport infrastructure. Not only does Hong Kong have a direct train line to the airport, which whisks you from Central to the terminals in under 20 minutes, but there’s also city check-in. This means that you can skip the queues at the airport by dropping your bags at the train station. You can either do this before you depart for the airport or, like me, you can check in early, leaving you bag-free to explore a little of Central before setting off for your flight. As it turned out, because my flight was (supposed to be) at 12 o’clock, I only had an hour to spare, but this was just long enough to head over to the Central branch of The Cupping Room for breakfast and a couple of farewell coffees. Suitably fortified, I headed out to the airport, where the train ride proved to be the best part of the whole experience! The train line, once it’s left Central and the built-up areas of Kowloon, runs along the north shore of Lantau Island. For mountain views, sit on the left (on the way out to the airport), while for sea views, you need the right (left if you’re coming into Hong Kong). I sat on the left, although I think that for photo opportunities, the other side would have been better. Hong Kong airport itself is an amazing, modern structure, with soaring halls and is, perhaps, the best airport I’ve flown from. There are two terminals, one to either side of the train station, so you just get off on the left if you’re flying from Terminal 1 and on the right if departing from Terminal 2. Other airports could learn a lot from this! Now comes the less good part: my flight was delayed by what turned out to be almost two hours, although when I arrived the departure boards were saying an hour. It turns out that, like most airports, Hong Kong is not at its best when a flight is delayed, although it quickly redeemed itself, earning extra brownie points in the process. When my flight’s delayed (or I arrive in plenty of time), I require three things: a seat (preferably with a table), power and a view of the departure board so I can see when/which gate my flight is departing from. If I’m going to be stuck for an hour or more, I really just want to settle down with my stuff and get on with something useful (like writing the next Coffee Spot post). I do not want to have to constantly get up and wander over to a departure board to find that my flight is boarding! Sadly this is the experience I have in most airports and, at first, it seemed that Hong Kong would fall into this category. However, within half an hour, the gate was displayed, which is something else other airports could learn from. This meant I could go down to the gate and settle in without fear of my flight leaving without me! As a bonus, Hong Kong airport has lots of seating at the gates, plus lots of power, the only slight drawback being that the two are not anywhere near each other! On the other hand, standing for an hour or so wasn’t a big issue given I’d be sitting on the plane for long enough. As it was, we boarded an hour late, then spent another 45 minutes at the gate before we pushed back and taxied down to the runway. After my last two take-offs, both of which were on A380s, our little A321 positively shot off down the runway and, in 30 seconds, we were airborne. After all the delays, the flight itself, with China Eastern airlines, was pretty good. It’s the first time I’ve flown with China Eastern and I was impressed. It was comfortable, the food was good and the service attentive (I’ve since flown with China Eastern again, this time flying business class from London to Shanghai) . Since I was coming from Hong Kong, I arrived at Hongqiao Airport, which mostly serves domestic flights. This is Shanghai’s original airport, to the west of the city and should not be confused with the more modern Pudong Airport to the southeast where most of the international flights arrive and depart. In terms of the distance between them, think Heathrow and Gatwick (or Newark and JFK for American readers). After hearing my colleagues’ experiences of getting from Pudong Airport to the centre, I think I had the best of it (although I’ve since flown in/out of Pudong and not had any problems). I was quickly through customs and onto the metro, which was a direct line into the centre, my hotel being a 15-minute walk from the metro at the other end. Other than the delay, it was an excellent journey. You can see what I made of Shanghai after the gallery. Having never been to Shanghai before, I wanted to share my first impressions with you. I’ll leave more practical details, such as my delightful hotel, how to get about and where to find the good coffee shops, to later instalments of this post. First, a little background. Although I’m well-travelled, it’s almost exclusively been in Europe and North America, in many ways culturally very similar to my home in the UK. I first ventured outside of this region eight years ago when I went to both Hong Kong and Marrakech. Then, the following year, I ventured to Barbados and St Lucia, after which my spirit of adventure seemed to disappear and I returned to the well-trodden paths of Europe and North America. One of the many benefits of my new job is that it’s given me the impetus I need to venture outside my comfort zone once again. Arriving in Shanghai, I had very little in the way of pre-conceptions and the few that I did have were way off the mark. Having been to Hong Kong before, I expected, without really thinking, that Shanghai would be like Hong Kong. I mean, they’re both in China, right? Never mind that one was a British colony until 1997 and is still a special administrative region. Never mind that they’re over 1,000 km apart, roughly the distance that separates London from Berlin. Or Milan. Or the same as from New York to Chicago. If I had stopped to think about it, I’d have quickly realised that Shanghai was never likely to be like Hong Kong. After all, I’ve travelled widely enough in America (although mostly east and west coasts, plus the Midwest) and in all my time, I’ve never found one American city to be too much like another. Boston, New York, Philadelphia, Washington DC, all east coast cites, all very different. Even my own experience of travelling around the UK could have told me that. London is not at all like Edinburgh. Nor is Glasgow, for that matter. However, I arrived with the thought that Shanghai would be like Hong Kong and then spent my first couple of days thinking “this is nothing like Hong Kong!”. Well, duh. The second thing that struck me was how many electric bicycles and scooters there were. I’d say at least 75% were electric, so the traffic was quite quiet and very few people peddled, even on bicycles. In keeping with the optional nature of the traffic lights, pavements seemed to be treated as free car/bike/scooter parks in a lot of areas. Transport aside, Shanghai is a city of contrasts. There is plenty of very obvious wealth, which is in sharp relief to the everyday lives of most people. That said, I saw very little evidence of out-and-out poverty (homelessness, for example). Having come from Hong Kong, a very densely populated city, defined and limited by its mountainous geography, Shanghai was flat, having the sort of sprawl I associate with, say, Chicago, where the city can just carry on expanding. So while the population is a staggering 25 million, it felt a lot less crowded than Hong Kong and, certainly in the areas I was in, there were far fewer high-rise buildings, the main concentration being over in Pudong, where skyscrapers have multiplied at an astonishing rate in the last 20 years. Of the 40 tallest buildings in Shanghai, 37 have been built since the year 2000, and before 1994, there was no building over 170m tall in the city (there are now 83!). With it’s rich, albeit somewhat colonial history, Shanghai has been bequeathed some magnificent old buildings, many of which line the west bank of the Huangpu River, the famous Bund. Here the grand colonial architecture faces off across the river to the new skyscrapers of Pudong. For fans of modern architecture (and, at nights, pretty lights), this is a must-see, particularly from the vantage point of the broad, riverside walk that runs a kilometre or so from the people’s memorial in the north to the lighthouse in the south. The western side, with its old colonial buildings (banks, company headquarters and so on) is also worth a look, but the vantage point is less impressive. 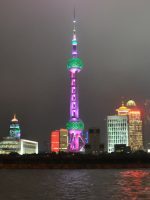 However, to give the impression that Shanghai is a city of modern skyscrapers and nothing else would be highly misleading. Other than the new development in Pudong and another concentration of skyscrapers, mostly hotels, on the northern bend of the Huangpu River, Shanghai’s a much more low-rise city. Although busy, it felt on a much more human scale than the new development would suggest. Not that I had too much time to explore, since I was in Shanghai to work. I spent my first five days making the four-minute walk from where I was staying, the Astor House Hotel, to where my meeting was taking place, the Hyatt. Other than a walk or two along the Bund at night, plus the staggering view from the bar on the 34th floor at the top of Hyatt, I saw very little of Shanghai until the weekend, but I’ll leave that for another time. Don’t forget to check back regularly for updates as I recount my adventures in Shanghai. This entry was posted in Brian's Travel Spot, Hong Kong, Shanghai by Brian Williams. Bookmark the permalink. There is very little speciality coffee at airports, although the quality is slowly getting better. Stockholm is one exception, as are Atlanta (I think) and Portland. I don’t think it’s a case of the big boys elbowing out the little guys, rather than airport rents are so large the small players can’t afford them. Stanstead airport outside London has a Harris & Hoole, which although a chain (once owned by Tesco at that! ), still serves decent coffee, and the best I’ve had in any UK airport. i know that Portland is well served according to my husband who travels there regualrly on business. Has anyone else been there? He tells me it is the closest thing to the UK he has ever seen.. how you interpret that is your business!